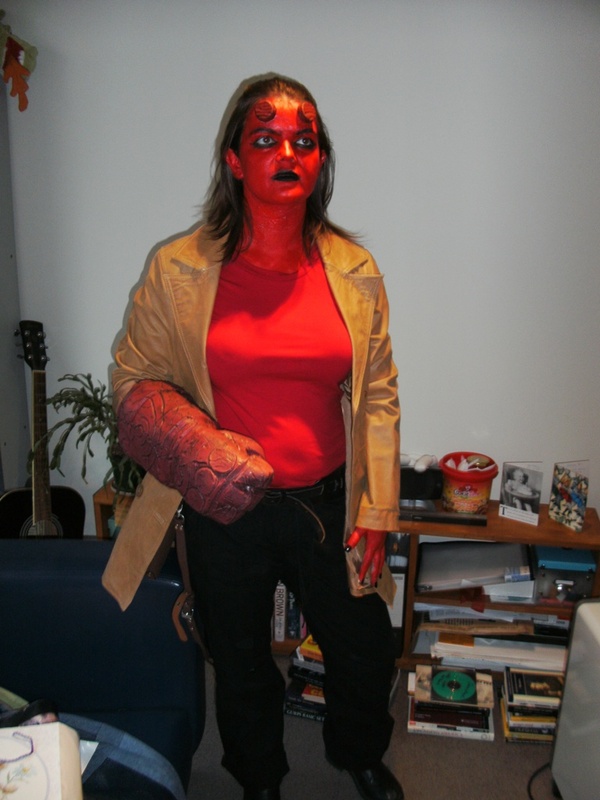 You may recall that I had a big plan to become Hell Girl for my work Hallowe’en party. Well it happened. Lots of red face paint. The face paint was a bad idea. It was just cheap stuff from Whitcoulls and it started itching after about an hour and then it started peeling. Particularly on the parts of me that move a lot such as my neck and next to my mouth. The effect was good though and I won the prize for best dressed female. Yay! Walking through town to get to the party was pretty funny. Lee was dressed as my FBI ‘minder’ so he looked relatively normal. I didn’t have my glasses on so I couldn’t see too many reactions but I did make some little girls scream. They saw me coming out of a mass of people crossing Taranaki St and shrieked. It was hilarious. Also ran into Steve and someone Lee knew. Even walking through the bar to the private function room was a bit of a trial. 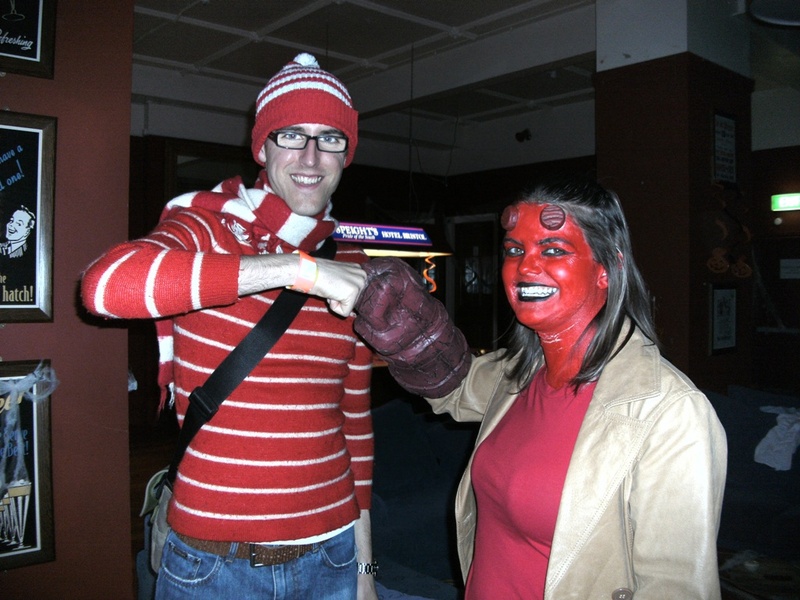 Fist bumping was the obvious motif for posing. Here seen with reader of this blog and excellent person Sam-the-deer. Up close and personal with a Moulin Rouge dancer. I found Wally! Fist bump. 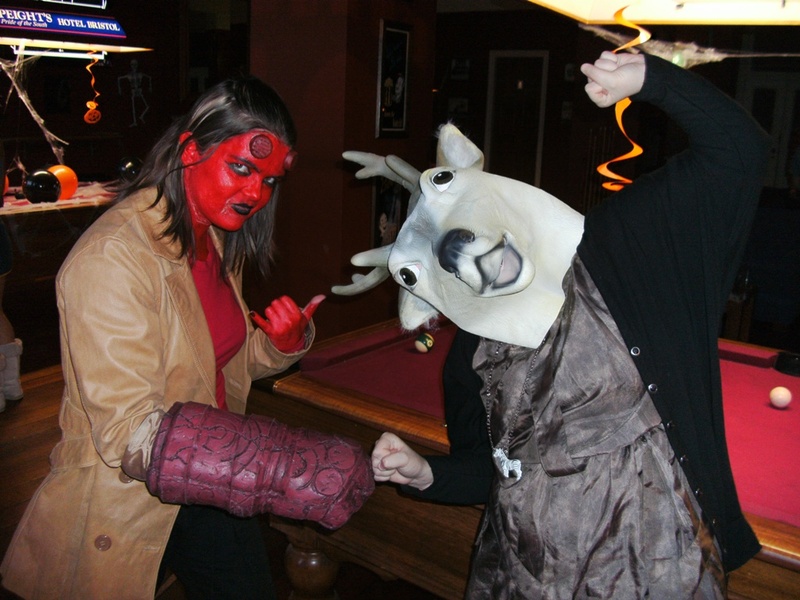 This entry was posted in Uncategorized and tagged costumes by Jamie. Bookmark the permalink. You are a legend. Also, Wally makes me smile. Awesome Awesome costume! Well done. I find the deer strangely disturbing…. i originally thought that deer was looking at you.. so now i only see it as some sort of cerberus deer. 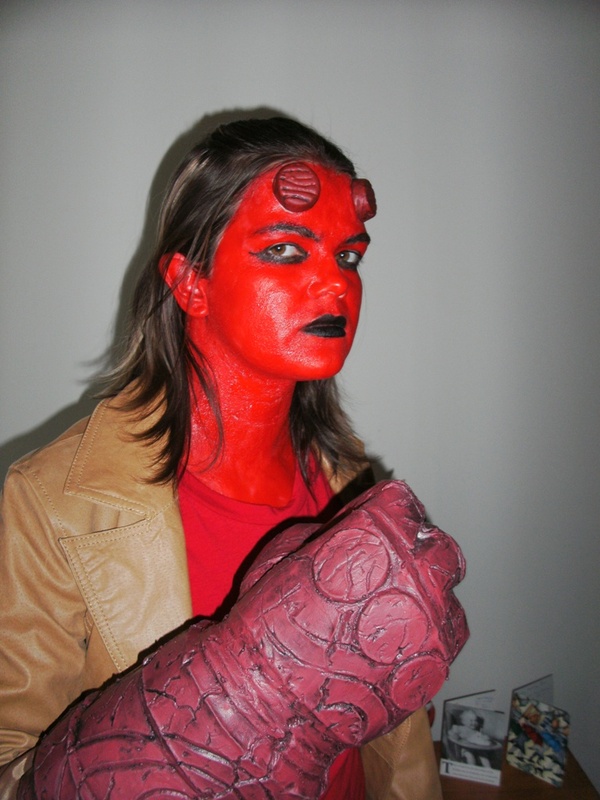 absolutely fantastic costume – yay Hell girl! I wonder – were her parents overly tolerant or overly r.estrictive? Is Talula carrying on a family tradition or rebelling.